Last weekend,I felt my voice turning hoarse and I groaned inwardly,”Oh dear!This is a terrible time to fall sick.”I had a full weekend with friends from Sweden visiting us and we had made some plans to spend some time with them.Which we did,and we had a very good time. I depended on gallons of water ,which my colleagues took turn to refill my trusty old cup. And I raided the pharmacy for my supply of lozenges and Vitamin C.
On Tuesday I could begin to talk audibly but my voice was just a little better than a croak.I was also nursing a terrible cough the next few days.Today,however,I am feeling much,much better and after one week,I have also come to realise a few things. I am thankful for my health.It is so easy to take for granted the ability to carry on everyday in whatever we do,and forgetting to be thankful for good health.It is so easy to either wallow in self pity or even gripe and groan when we fall ill.So I am re-learning to be thankful for my health. 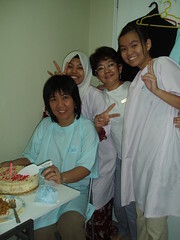 I also realise that I have many people around me who care a lot for me.Needless to say,my husband and children were concerned for me,and my 11-year-old son even prayed for me one night,for me to recover quickly,after hearing me cough so profusely.My colleagues were also busy fussing over me,getting water and lozenges for me in the midst of work.Even some of patients were concerned,and wished me quick recovery. As I move into the coming week,there are many things that can affect my emotions this week.Well,I am choosing to be thankful.For health,for family,for work,for friends and for the people I come in contact with daily,who will somehow or another,enrich my life. One of the factors that make our work enjoyable is when we have good work mates.And I have to say that my fellow colleauges are a delight to be with.Everyone is so different in their own way and yet when we get together for work there is a synergy that exists and it enables every single one of us to perform our work well. 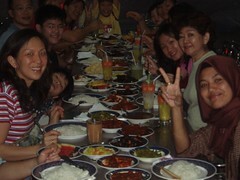 Over the weeks and months,we have become very good friends with one another.We not only work together;we eat together,we laugh together,we even lend our shoulders to one another to cry on. 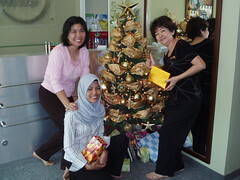 I truly appreciate them for their good attitude towards work.They are always so ready to give their best and no one is afraid to do more than they need to;Elaine at the front desk,Siti and Kathy in the surgery.Even Davina,who is new and working on a temporary basis while waiting to further her studies,has caught on to the work attitude that comes so naturally from everyone in the team. I am truly blessed to have such a wonderful team at iSmile. When does a baby gets his or her first tooth?The age actually varies. 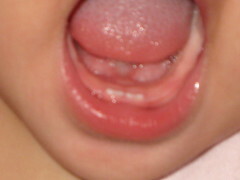 Sometimes,rarely though,babies are born with one or two teeth in their mouth.These are called natal teeth .There are also incidences where the tooth appears about a month after birth and these are called neo natal teeth.There is really no cause for concern except that if these teeth are loose,they should be removed to prevent the child from swallowing or aspirating it. Some children only get their first teeth at around 18 months old.So,the range is quite variable.However the average age of a child’s first tooth eruption would be at around 6 month of age and by the time the child turns 3,he/she will have a full set of 20 milk teeth. 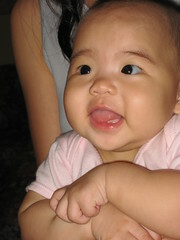 This Celine Yong,at 5 month old,showing signs of her 2 lower front teeth erupting.Girls generally precede boys in tooth eruption. There may be some discomfort associated to the teething process like excessive drooling,gum sensitivity,irritbility and the child refusing food.Usually,by giving the child something to chew on,like a teething ring or teething crackers,like help ease the problem,or you can just rub a clean finger over the gum area. Around the age of 4,the jaw and facial bones of a child begin to grow,and there will be spaces between the milk teeth.This is a natural growth process,to provide the necessary space for the larger permanent teeth to erupt. 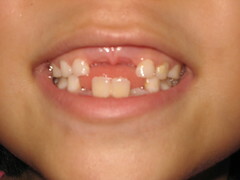 In spite of the fact that the milk teeth will eventually fall out and replaced by the permanents,they do play a very important role.They reserve space for the permanent teeth,they help in development of clear speech and they enable the child to eat properly(missing or decayed milk teeth will cause children to reject food). Around the age of 6,the permanents start to appear.In some children,the permanent molars start to appear behind the last milk molar,and in some others,the lower front teeth come out first.It is important to be aware of this because sometimes the permanents appear behind the milk teeth before they fall out.Usually at this point,the milk teeth in front would be rather loose. 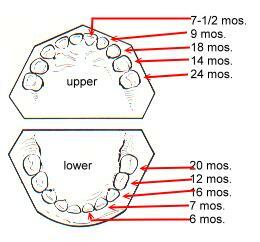 Below is the eruption schedule for the permanent teeth,again based on average statistics. 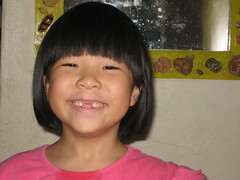 This Tjia-Yi,aged 6 and the half.She has lost her 4 lower and 2 upper milk teeth,and she has 2 lower permanents out and the 2 adjacent ones on their way out. 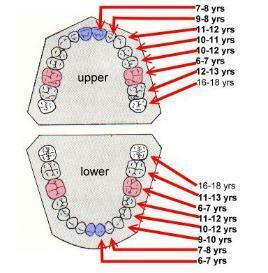 By age 13,most of the permanent teeth will be in place.The 4 3rd molars or wisdom teeth will emerge between age 17 and 21,bringing the total number of permanent teeth to 32.